First Cakes…now Tarts! Our luscious TARTS have been such a hit at Café Trophy in Bellevue we just had make them available for pick up at every Trophy location (of course you can have them delivered too)! 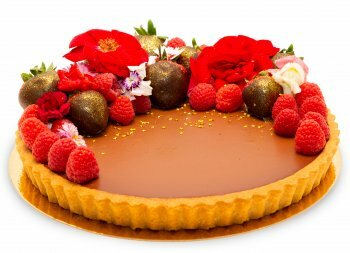 Our Tarts are made with exquisite ingredients and luxe style, perfect when you want a little more chichi at your party! If you haven’t tried our cakes yet, they’re made with the same components of your favorite Trophy Cupcake flavors…plus some new surprises. We channeled Willy Wonka to create our “Magic Cakes”, because who doesn’t want an over-the-top cake to celebrate life and share with friends! * Please note that cakes and tarts need to be ordered two days in advance so, please order by 5 pm two days before your pick up or delivery date. 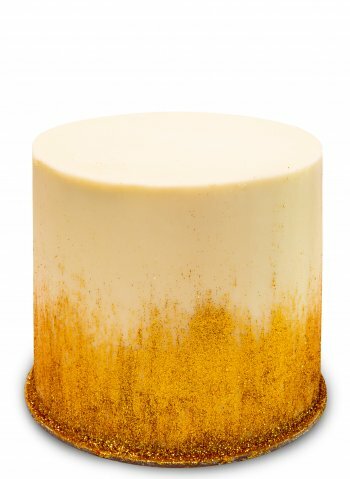 Trophy CAKES and TARTS are finally here! Of course, they’re baked from scratch with the same exquisite ingredients and Love as each and every Trophy Cupcake! 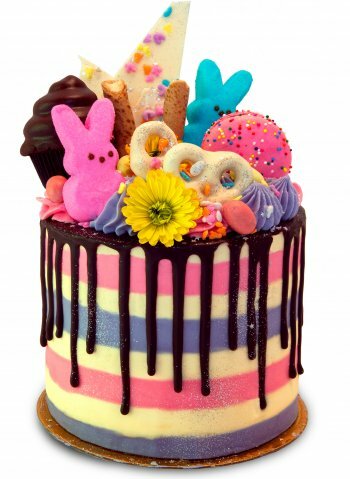 Four delicious layers of Valrhona chocolate cake frosted with pink, lavender and white striped buttercream crowned with a party of magical Easter themed Trophy-treats! 6” round, four-layers and serves 8-10 people. 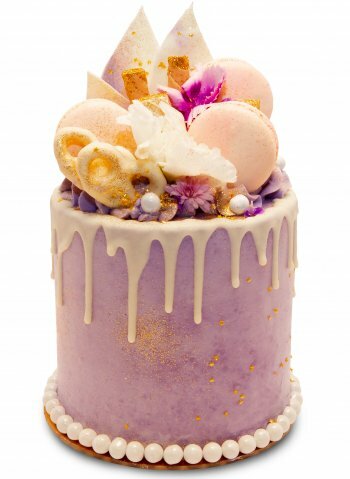 Our Luxe Lavender cake is simply stunning! Wow your guests with four delicious layers of Valrhona chocolate cake frosted with lavender buttercream. The real fun begins with a white chocolate drip that is crowned with as many luxe treats as we could fit on top! You’ll enjoy blush Strawberry Cheesecake macarons, white chocolate and lavender sprinkle bark, glitter dipped wafer cookies, gilded pretzels, lovely edible flowers, a “beaded edge" of white candy coated chocolate sixlets and plenty of mini gold star sprinkles and gold glitter! Now that’s Luxe! 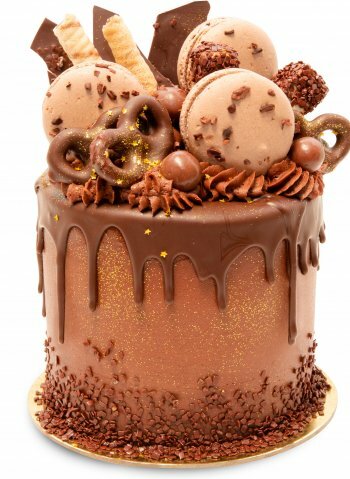 Four layers of Valrhona chocolate cake frosted with our Belgian chocolate buttercream and topped with a bevy of chocolatey treats, gold stars and glitter. 6” round, four-layers and serves 8-10 people. 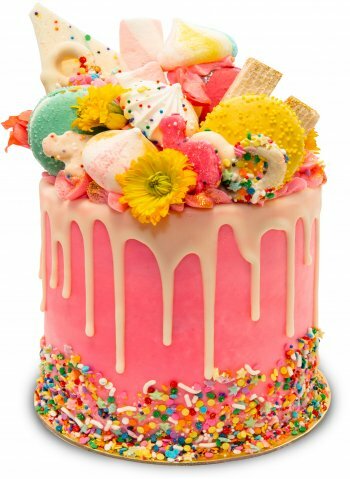 Four delicious layers of Valrhona chocolate cake frosted with pink and white Madagascar vanilla buttercream topped with a ring of buttercream stars, rainbow sprinkles seven classic pastel birthday candles. 6” round, four-layers and serves 8-10 people. Four delicious layers of Valrhona chocolate cake frosted with Madagascar vanilla buttercream and dressed up with edible gold glitter. 6” round, four-layers and serves 8-10 people. 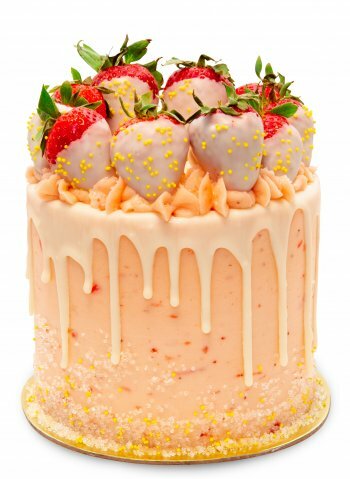 Four delicious layers of fresh lemon cake frosted with strawberry buttercream and finished with white chocolate dipped strawberries and sprinkles. 6” round, four-layers and serves 8-10 people. 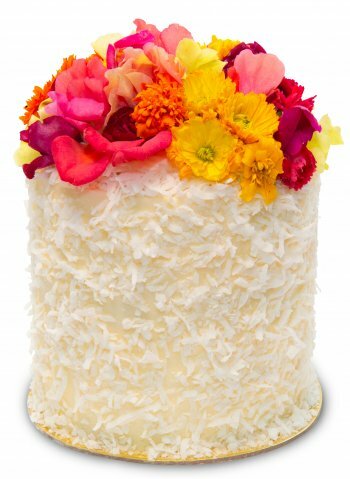 Four delicious layers of coconut cake frosted with coconut buttercream, covered in coconut flakes and crowned with edible flowers. 6” round, four-layers and serves 8-10 people. 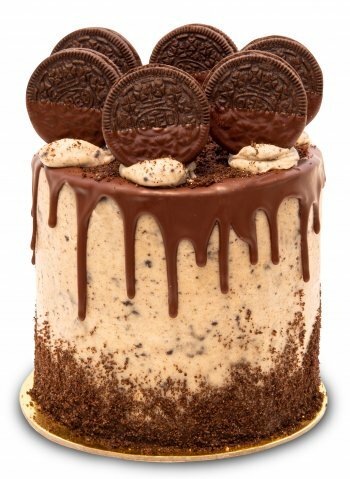 Four delicious layers of Valrhona chocolate cake frosted with cookies and cream buttercream that’s topped with chocolate dipped Oreos. 6” round, four-layers and serves 8-10 people. 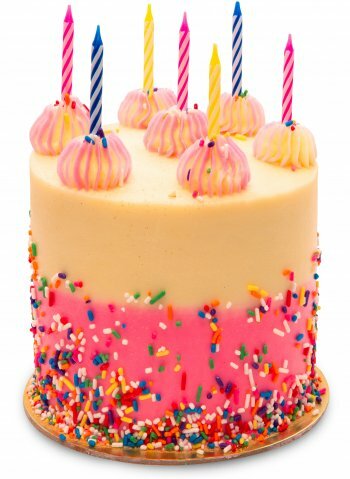 Four delicious layers of Madagascar vanilla cake frosted with pink buttercream and a party of magical Trophy-treats on top! 6” round, four-layers and serves 8-10 people. Our signature Trophy-Blue party cake is pure magic! Wow your guests with four delicious layers of Valrhona chocolate cake frosted with aqua buttercream. The real fun begins with a dark chocolate drip that is crowned with as many magical treats as we could fit on top! 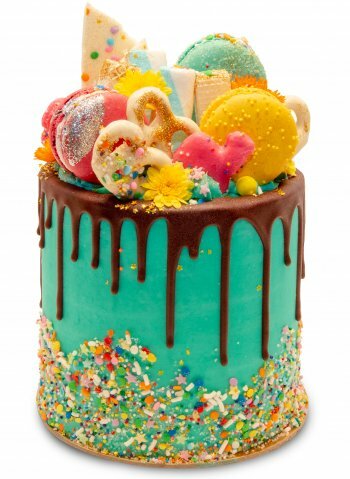 You’ll enjoy colorful macarons, striped meringues & marshmallows, white chocolate sprinkle bark, glitter dipped wafer cookies sprinkle coated pretzels, lovely edible flowers, classic frosted animal cookies and plenty of custom yumfetti sprinkles! Now that’s magic! 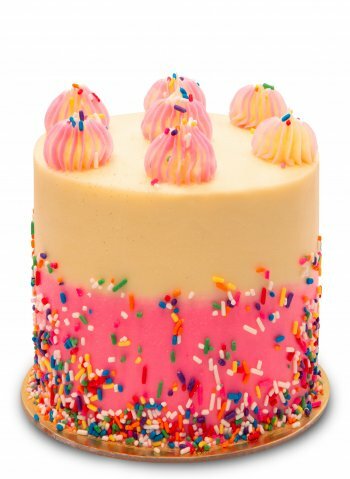 Four delicious layers of Valrhona chocolate cake frosted with pink and white Madagascar vanilla buttercream topped with a ring of buttercream stars and rainbow sprinkles. 6” round, four-layers and serves 8-10 people. 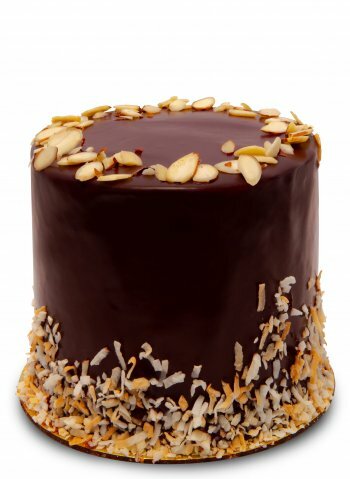 Four delicious layers of Almond cake frosted with coconut buttercream and enrobed in Belgian chocolate ganache. 6” round, four-layers and serves 8-10 people. Four delicious layers of Valrhona chocolate cake frosted with Madagascar vanilla buttercream and decorated with edible gold glitter. 6” round, four-layers and serves 8-10 people. 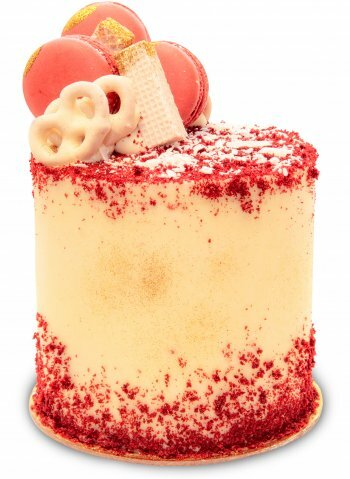 Four layers of red velvet cake frosted with cream cheese buttercream between the layers and Madagascar vanilla buttercream outside, decorated with macarons, pretzels & wafer cookies. 6” round, four-layers and serves 8-10 people. 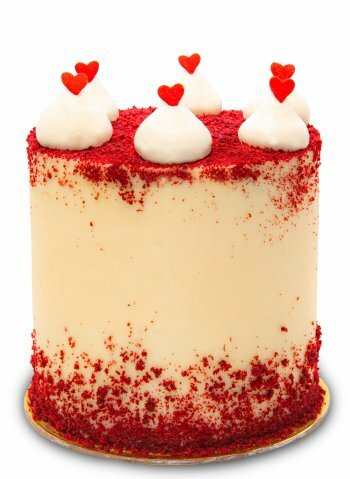 Four layers of red velvet cake frosted with cream cheese buttercream between the layers and a Madagascar vanilla buttercream outside, decorated with red velvet dust and red hearts. 6” round, four-layers and serves 8-10 people. 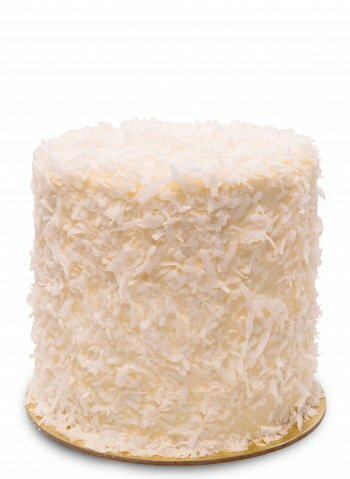 Four delicious layers of coconut cake frosted with coconut buttercream and covered in coconut flakes. 6” round, four-layers and serves 8-10 people. 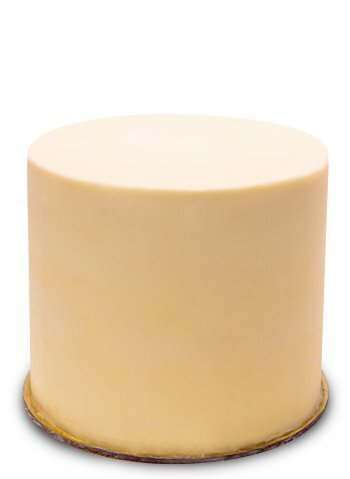 Four Valrhona chocolate layers frosted smooth with Madagascar vanilla buttercream. 6” round, four-layers and serves 8-10 people. Our luscious TARTS have been such a hit at Café Trophy in Bellevue we just had make them available for pick up at every Trophy location (of course you can have them delivered too)! 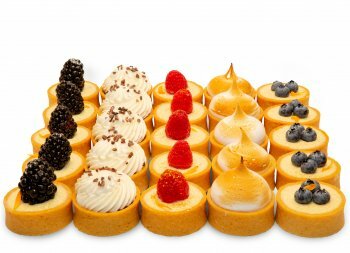 Our Tarts are made with exquisite ingredients and luxe style, perfect when you want a little more chichi at your party! Your guests will swoon over this absolutely stunning tart! Our 10” Luxe Manjari Chocolate Ganache Tart starts with a shortbread cookie crust that’s filled with Valrhona Manjari chocolate ganache. It’s then topped with yummy chocolate covered strawberries, fresh raspberries, gorgeous edible flowers and glitter. Serves 8-10. Chocolate connoisseurs will love our Classic 10” Manjari Chocolate Ganache & Cream Tart. 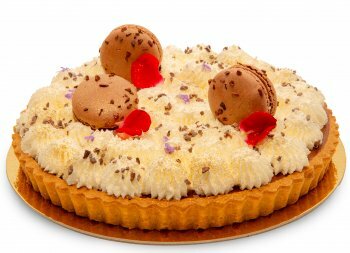 It starts with a shortbread cookie crust that’s filled with Valrhona Manjari chocolate ganache and is topped with whipped cream, Valrhona cocoa nibs and chocolate dipped chocolate fleur de sel macarons. Serves 8-10. This Luxe Lemon tart is the thing dreams are made of. 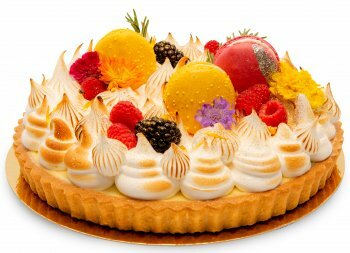 The 10” Luxe Lemon Meringue Tart starts with a shortbread cookie crust that’s filled with luscious tart and tangy lemon curd. Toasted meringue kisses adorn the top, along with our Lemon and Raspberry Champagne macarons, fresh berries, edible flowers and glitter. Serves 8-10. 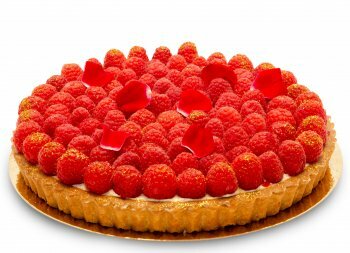 Our stunning 10” Raspberry Mascarpone Tart starts with a shortbread cookie crust filled with a thin layer of almond frangipane topped off with our not-too-sweet mascarpone diplomat cream. 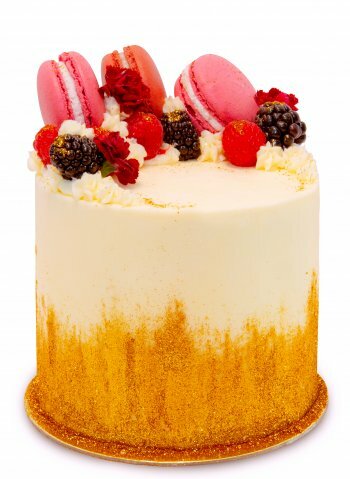 It is then topped with raspberry jam, a crown of fresh raspberries, edible flower petals and glitter. Serves 8-10. You can never go wrong with fresh berries and mascarpone. 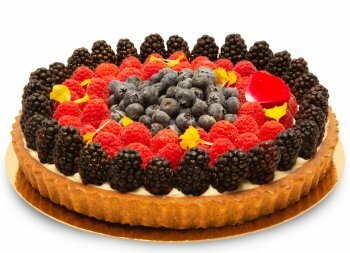 Our 10” Fresh Fruit Mascarpone tart starts with a shortbread cookie crust filled with a thin layer of almond frangipane topped off with our not-too sweet mascarpone diplomat cream. It is then finished with berry jam, a crown of fresh raspberries, blackberries and blueberries, edible flower petals and glitter. Serves 8-10. Bite size shortbread cookie tart shells filled with mascarpone diplomat cream and topped with fresh raspberries, blackberries and blueberries. 25 per box. 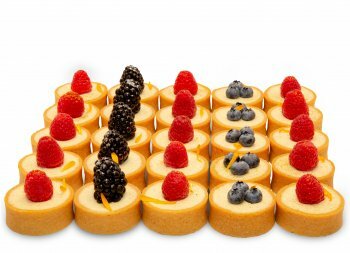 Your guest will enjoy five Valrhona Manjari Chocolate ganache tart bites, five lemon meringue tart bites and 15 assorted fruit mascarpone tart bites with fresh berries. 25 per box- perfect for dessert bars, brunch and high tea. What’s perfect for a party full of lemon lovers? 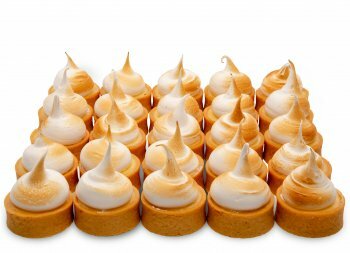 Bite size Lemon Meringue tarts! Mini shortbread cookie tart shells are filled with lemon curd topped with kisses of toasted meringue. 25 per box. Perfect for dessert bars, garden parties and high tea. The perfect little taste of rich Manjari chocolate in every bite! 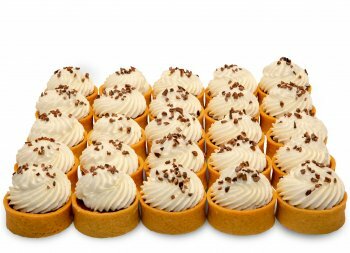 25 Mini shortbread cookie tart shells filled with Valrhona Manjari Chocolate Ganache and topped with whipped cream and Valrhona cocoa nibs. Perfect for chocolate-lover parties, dessert bars and dinner parties.